Sir Michael John Gambon CBE (born 19 October 1940) is an Irish-born British character actor who has worked in theatre, television, and film. He was trained under Laurence Olivier and started his long work on stage in the National Theatre before retiring in 2015 due to memory loss. Gambon portrayed Professor Albus Dumbledore in the final six Harry Potter films after the death of Richard Harris who had previously played the role. His other films include, The Cook, the thief, His Wife, and Her Lover (1989), The Wings of the Dove (1997), Sleepy Hollow (1999), Gosford Park (2001), Being Julia (2004), Amazing Grace (2006), The King's Speech (2011), Quartet (2012), Victoria and Abdul (2017), and the Paddington films (2014, 2018). Gambon has appeared in various television projects including, The Singing Detective (1986), Wives and Daughters (1999), Path to War (2002), Angels in America (2003), Cranford (2007), Emma (2008), Restless (2012), The Casual Vacancy (2015), Churchill's Secret (2016), The Hollow Crown (2016), and Little Women (2017). He was knighted in 1998 for services to drama, and has won four BAFTA TV Awards, three Olivier Awards and was awarded the Irish Film & Television Academy Lifetime Achievement Award in 2017 for his contribution to Irish film. 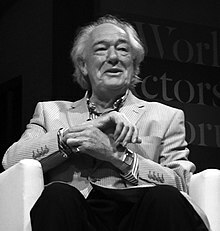 Gambon was born in Cabra, Dublin, during World War II. His father, Edward Gambon, was an engineering operative, and his mother, Mary (née Hoare), was a seamstress. As his father decided to seek work in the rebuilding of London, the family moved to Mornington Crescent in north London, when Gambon was six. His father had him made a British citizen, a decision that would later allow Gambon to receive a substantive, rather than honorary, knighthood and CBE. Brought up as a strict Roman Catholic, he attended St Aloysius Boys' School in Somers Town and served at the altar. He then moved to St Aloysius' College in Hornsey Lane, Highgate, London, whose former pupils include actor Peter Sellers. He later moved to North End, Kent, and attended Crayford Secondary School, before leaving with no qualifications at fifteen. He then gained an apprenticeship with Vickers Armstrong as a toolmaker. By the time he was 21, he was a qualified engineering technician. He kept the job for a further year, acquiring a fascination and passion for collecting antique guns, clocks, watches and classic cars. At age 24, Gambon wrote a letter to Micheál Mac Liammóir, the Irish theatre impresario who ran Dublin's Gate Theatre. It was accompanied by a CV describing a rich and wholly imaginary theatre career: he was taken on. Gambon made his professional stage debut in the Gate Theatre's 1962 production of Othello, playing "Second Gentleman", followed by a European tour. A year later, auditioning with the opening soliloquy from Richard III, he caught the eye of Laurence Olivier who was recruiting promising actors for his new National Theatre Company. Gambon, along with Robert Stephens, Derek Jacobi and Frank Finlay, were hired as one of the "to be renowned" and played any number of small roles, appearing on cast lists as "Mike Gambon". The company initially performed at the Old Vic, their first production being Hamlet, directed by Olivier and starring Peter O'Toole. Gambon played for four years in many NT productions, including named roles in The Recruiting Officer and The Royal Hunt of the Sun, working with directors William Gaskill and John Dexter. After three years at the Old Vic, Olivier advised Gambon to gain experience in provincial rep. In 1967, he left the NT for the Birmingham Repertory Company, which was to give him his first crack at the title roles in Othello (his favourite), Macbeth and Coriolanus. His rise to fame began in 1974 when Eric Thompson cast him as the melancholy vet in Alan Ayckbourn's The Norman Conquests at Greenwich. A speedy transfer to the West End established him as a comic actor, squatting at a crowded dining table on a tiny chair and agonising over a choice between black or white coffee. Back at the National, now on the South Bank, his next turning point was Peter Hall's premiere staging of Harold Pinter's Betrayal, a performance marked by subtlety – a production photograph shows him embracing Penelope Wilton with sensitive hands and long slim fingers (the touch of a master clock-maker). He is also one of the few actors to have mastered the demands of the vast Olivier Theatre. As Simon Callow once said: "Gambon's iron lungs and overwhelming charisma are able to command a sort of operatic full-throatedness which triumphs over hard walls and long distances". This was to serve him in good stead in John Dexter's masterly staging of The Life of Galileo in 1980, the first Brecht to become a popular success. Hall called him "unsentimental, dangerous and immensely powerful," and The Sunday Times called his performance "a decisive step in the direction of great tragedy... great acting," while fellow actors paid him the rare compliment of applauding him in the dressing room on the first night. Ralph Richardson dubbed him The Great Gambon, an accolade which stuck, although Gambon dismisses it as a circus slogan. But as Sheridan Morley perceptively remarked in 2000, when reviewing Nicholas Wright's Cressida: "Gambon's eccentricity on stage now begins to rival that of his great mentor Richardson". Also like Richardson, interviews are rarely given and raise more questions than they answer. Gambon is a very private person, a "non-starry star" as Ayckbourn has called him. Off-stage he prefers to stay out of the limelight. While he has won screen acclaim, his ravaged King Lear at Stratford, while he was still in his early forties, formed a double act with a red-nosed Antony Sher as the Fool sitting on his master's knee like a ventriloquist's doll. There were also appearances in Pinter's Old Times at the Haymarket Theatre and Jonson's Volpone and the brutal sergeant in Pinter's Mountain Language. David Hare's Skylight, with Lia Williams, which opened to rave reviews at the National in 1995, transferred first to Wyndham's Theatre and then on to Broadway for a four-month run which left him in a state of advanced exhaustion. "Skylight was ten times as hard to play as anything I've ever done" he told Michael Owen in the Evening Standard. "I had a great time in New York, but wanted to return." Gambon was not among the actors to grace Yasmina Reza's ART at Wyndham's. But together with Simon Russell Beale and Alan Bates, he gave a droll radio account of the role of Marc. And for the RSC he shared Reza's two-hander The Unexpected Man with Eileen Atkins, first at The Pit in the Barbican and then at the Duchess Theatre, a production also intended for New York but finally delayed by other commitments. In 2001, he played what he described as "'a physically repulsive" Davies in Patrick Marber's revival of Pinter's The Caretaker, but he found the rehearsal period an unhappy experience, and felt that he had let down the author. A year later, playing opposite Daniel Craig, he portrayed the father of a series of cloned sons in Caryl Churchill's A Number at the Royal Court, notable for a recumbent moment when he smoked a cigarette, the brightly lit spiral of smoke rising against a black backdrop, an effect which he dreamed up during rehearsals. In 2004, Gambon played the lead role (Hamm) in Samuel Beckett's post-apocalyptic play Endgame at the Albery Theatre, London. In 2005 he finally achieved a lifelong ambition to play Falstaff, in Nicholas Hytner's National production of Henry IV, Parts 1 and 2, co-starring with Matthew Macfadyen as Prince Hal. He performed as Joe in Beckett's Eh Joe, giving two performances a night at the Duke of York's Theatre in London. In 2008, Gambon appeared in the role of Hirst in No Man's Land by Harold Pinter in the Gate Theatre, Dublin, opposite David Bradley as Spooner, in a production directed by Rupert Goold, which transferred to the London West End's Duke of York's Theatre, for which roles each received nominations for the 2009 Laurence Olivier Award for Best Actor. In late 2009, Gambon had to withdraw from his role of W. H. Auden in The Habit of Art (being replaced by Richard Griffiths) because of ill health. In April 2010, Gambon returned once again to the Gate Theatre Dublin to appear in Samuel Beckett's Krapp's Last Tape, which transferred to London's Duchess Theatre in October 2010. In 2012, he starred with Eileen Atkins in an adaptation of Beckett's radio play, All That Fall. Its premiere was at the Jermyn Street Theatre and it later transferred to the Arts Theatre. All That Fall had such good reviews in London that they took it to New York. In New York, they recast the role of Jerry and Liam Thrift got the part. They were a huge hit in New York, in 2013, and sold out the whole run after 4 days. In early 2015, Gambon announced that due to the increasing length of time it was taking him to memorise his lines, he was giving up stage work. He stated that 'It's a horrible thing to admit". He had previously tried using an earpiece and being given prompts by theatre staff, but found this unsatisfactory, saying that 'after about an hour I thought, "This can’t work. You can’t be in theatre, free on stage shouting and screaming and running around, with someone reading you your lines.’ "
He made his film debut in the Laurence Olivier's Othello alongside Maggie Smith in 1965. His work includes such controversial films as The Cook, the Thief, His Wife & Her Lover, which also starred Helen Mirren. In 2004, he appeared in five films, including Wes Anderson's cult comedy The Life Aquatic with Steve Zissou; the British gangster film Layer Cake; theatrical drama Being Julia. Gambon appeared in the Robert Altman's acclaimed British murder mystery ensemble Gosford Park alongside Maggie Smith, Helen Mirren, Eileen Atkins, Kristen Scott Thomas, Derek Jacobi, Kelly MacDonald, Emily Watson, Alan Bates, Richard E. Grant, Charles Dance, Stephen Fry, Bob Balaban, Clive Owen, and Jeremy Northam. The film received widespread critical acclaim, review aggregator Rotten Tomatoes reports that 86% Certified Fresh with the critics consensus, "A mixture of Upstairs, Downstairs; Clue; and perceptive social commentary, Gosford Park ranks among director Altman's best." The film went on to receive seven Academy Awards nominations (including Best Picture and Best Director, both of which it lost to A Beautiful Mind); Julian Fellowes won the Best Original Screenplay. His best known role is perhaps his performances as Albus Dumbledore, Hogwarts's headmaster in the third installment of J. K. Rowling's franchise, Harry Potter and the Prisoner of Azkaban, taking over the role after the death of Richard Harris. (Harris had also played Maigret on television four years before Gambon took that role.) Gambon reprised the role of Dumbledore in Harry Potter and the Goblet of Fire, which was released in November 2005 in the United Kingdom and the United States. He returned to the role again in the fifth film, 2007's Harry Potter and the Order of the Phoenix, and the sixth film, Harry Potter and the Half-Blood Prince. He appeared in the seventh film; Harry Potter and the Deathly Hallows Parts I and II, released in two parts in 2010 and 2011. Gambon told an interviewer that, when playing Dumbledore, he does not "have to play anyone really. I just stick on a beard and play me, so it's no great feat. I never ease into a role—every part I play is just a variant of my own personality. I'm not really a character actor at all...'"
In 2007, Gambon appeared Michael Apted's historical drama Amazing Grace alongside Ioan Gruffudd, Romola Garai, Benedict Cumberbatch, Albert Finney, Rufus Sewell. The film focuses on William Wilberforce who led the campaign against the slave trade in the British Empire. The film is Certified Fresh according to Rotten Tomatoes with critics consensus describing the film as "your quintessential historical biopic: stately, noble, and with plenty of electrifying performances." In 2010 Gambon also appeared in Tom Hooper's acclaimed historical drama The King's Speech as King George V, alongside Colin Firth, Geoffrey Rush, Helena Bonham Carter, and Guy Pearce. The film received widespread critical acclaim, with Firth's, Rush's and Carter's performance receiving universal praise. Review aggregator Rotten Tomatoes gives the film a score of 95% Certified Fresh with the website's critical consensus reads: "Colin Firth gives a masterful performance in The King's Speech, a predictable but stylishly produced and rousing period drama. In 2011, the film received 12 Academy Awards nominations, more than any other film in that year. The film won four Oscars including Best Picture, Director, Actor, and Adapted Screenplay. In 2012 he played a role in Dustin Hoffman's directorial debut with Quartet, based on the same-titled play by Ronald Harwood and starring Maggie Smith, Tom Courtney, Billy Connolly and Pauline Collins. The film premiered at the 2012 Toronto International Film Festival to favorable reviews. The review aggregator website Rotten Tomatoes reported a 80% approval rating with the consensus reading, "It's sweet, gentle, and predictable to a fault, but Dustin Hoffman's affectionate direction and the talented cast's amiable charm make Quartet too difficult to resist." In 2016, Gambon served as the narrator for the Coen Brother's Hollywood comedy, Hail, Cesar! satirizing the 1950s Hollywood film industry. The ensemble also features, Josh Brolin, George Clooney, Ralph Fiennes, Channing Tatum, Scarlett Johansson, Alden Ehrenreich, Tilda Swinton, Jonah Hill, Frances McDormand, Alison Pill, and Clancy Brown. The film was well received by critics earning an approval rating of 86% on Rotten Tomatoes with the consensus being, "Packed with period detail and perfectly cast, Hail, Caesar! finds the Coen brothers delivering an agreeably lightweight love letter to post-war Hollywood." The film also received an Academy Award nomination for its Production Design. Gambon has also lent his voice as Uncle Pastuzo in the critically acclaim Paddington films (2014, 2018). The films star Ben Whishaw, Hugh Bonneville, Sally Hawkins, Julie Walters, Jim Broadbent, Peter Capaldi, Imelda Staunton, Brendan Gleeson, Hugh Grant, and Nicole Kidman. He famously starred as Georges Simenon's detective Inspector Jules Maigret in an ITV adaptation of Simenon's series of books. He also made television appearances in series such as Wives and Daughters (1999) (for which he won another BAFTA), a made-for-TV adaptation of Samuel Beckett's Endgame (2001) and Perfect Strangers (2001) have revealed a talent for comedy. Gambon played President Lyndon B. Johnson in the television film Path to War. For this performance, he was nominated for an Emmy Award for Best Actor in a Mini-series or Movie and a Golden Globe Award for Best Actor in a Miniseries or Motion Picture Made for Television. In 2003, he appeared with Robert Duvall and Kevin Costner, playing the principal villain in the Western film Open Range. In 1990 he played Jerry in Harold Pinter's Betrayal for BBC Radio 3. In 2006 he played Henry in Stephen Rea's play about Samuel Beckett's Embers for Radio 3. In 2007 he was Sam in Harold Pinter's The Homecoming for Radio 3. After Pinter's death on 24 December 2008, Gambon read Hirst's monologue selected by the playwright for Gambon to read at his funeral, held on 31 December 2008, during the cast's memorial remarks from the stage as well as at the funeral and also in Words and Music, transmitted on the BBC Radio 3 on 22 February 2009. In 2007 he played major roles in Stephen Poliakoff's Joe's Palace, and the acclaimed BBC five-part adaptation of Mrs Gaskell's Cranford novels alongside Judi Dench, and Imelda Staunton. In 2009, he appeared in a television adaptation of Jane Austen's famously irrepressible Emma, a four-hour miniseries that premiered on BBC One in October 2009, co-starring Romola Garai. He played Mr. Woodhouse for which he received a 2010 Primetime Emmy Award for Outstanding Supporting Actor in a Miniseries or a Movie nomination for his performance. In season 1 episode 8 of BBC's Top Gear, he was a Star in a Reasonably Priced Car. Around the last corner of his lap around the track, he came close to rolling the car. The corner from then on was named "Gambon Corner" or simply "Gambon" in his honour. In 2010, Gambon appeared in the 2010 Christmas Special of Doctor Who, "A Christmas Carol". In 2012, Gambon reunited with Dustin Hoffman in the HBO horse-racing drama Luck, which was canceled in March 2012 after three horses died on set. In 2014, he was cast in the role of Howard Mollison on the upcoming adaptation of the best-selling book The Casual Vacancy by author J. K. Rowling, who is also the author of the Harry Potter books. The BBC One miniseries, being produced in association with HBO, will comprise three one-hour parts. Production begun 7 July 2014 in South West England. In 2015 and 2018, Gambon starred as Henry Tyson in the first and third series of Sky Atlantic's Fortitude. He also appeared as the Narrator in the British version of Kröd Mändoon and the Flaming Sword of Fire. In 2013, Gambon provided the voice for The Prophet, a character in the MMORPG video game The Elder Scrolls Online. Gambon has performed voiceover for the Guinness ads with the penguins. and the CGI action fantasy Sky Captain and the World of Tomorrow. In the New Year Honours 1998, Gambon was appointed a Knight Bachelor for services to drama, and, on 17 July 1998, was invested by Prince Charles at Buckingham Palace. Gambon is a qualified private pilot and his love of cars led to his appearance on the BBC's Top Gear programme in December 2002. Gambon raced the Suzuki Liana and was driving so aggressively that it went round the last corner of his timed lap on two wheels. The final corner of the Top Gear test track has been named "Gambon" in his honour. He appeared on the programme again on 4 June 2006 and set a time in the Chevrolet Lacetti of 1:50.3, a significant improvement on his previous time of 1:55. He clipped his namesake corner the second time, and when asked why by Jeremy Clarkson, replied, "I dunno — I just don't like it." ^ "Michael Gambon Biography". filmreference. 2008. Retrieved 22 January 2009. ^ "Michael Gambon biography on tiscali". Tiscali.co.uk. Archived from the original on 10 March 2009. Retrieved 14 March 2010. ^ * Although, under the British Nationality Act 1981, anyone born in Ireland before 1949 can still register as a British subject and, after five years' UK residence, become a British citizen. ^ a b c Wills, Dominic. "Michael Gambon – Biography". TalkTalk Group. Retrieved 22 June 2010. Growing up in a mostly struggling Irish community, Michael was raised a strict Roman Catholic. ^ "St Aloysius do old boy Joe proud". Sunday Mirror. 8 February 2004. Archived from the original on 12 May 2013. Retrieved 30 October 2014. ^ "Surnames beginning with G". bexley.gov.uk. Archived from the original on 20 December 2016. Retrieved 9 December 2016. ^ "Michael Gambon – Biography". Biography.com. Retrieved 30 October 2014. ^ "No. 51981". The London Gazette (Supplement). 29 December 1989. p. 7. ^ "Endgame". Onlinereviewlondon.com. 8 May 2004. Retrieved 8 November 2011. ^ Kellaway, Kate. "Krapp's Last Tape". Duchess Theatre. Retrieved 7 February 2015. ^ Harrison, David (8 February 2015). "Unscripted end to Gambon's career on stage". The Sunday Times UK. Retrieved 8 February 2015. ^ "Sir Michael Gambon forced to quit theatre due to 'frightening' memory loss". Telegraph.co.uk. 8 February 2015. Retrieved 8 February 2015. ^ "Q&A with Michael Gambon, Professor Albus Dumbledore in Harry Potter". Futuremovies.co.uk. 5 July 2007. Retrieved 8 November 2011. ^ "BBC – Drama on 3 – Embers". Bbc.co.uk. 16 May 2010. Retrieved 8 November 2011. ^ "BBC – Drama on 3 – The Homecoming". Bbc.co.uk. 18 March 2007. Retrieved 8 November 2011. ^ Singh, Anita (4 April 2009). "Romola Garai to play Emma in BBC's latest Jane Austen adaptation". Telegraph. London. Retrieved 15 November 2009. ^ "Top Gear, Season 1, Episode 8". Motoringbox.com. Retrieved 25 February 2017. ^ Michael Gambon Appears on BBC, Katherine Jenkins to star in Christmas Doctor Who. ^ "Casting Call". TV Guide. 15–21 March 2010. ^ a b "BBC, HBO Announce Cast for J. K. Rowling's 'The Casual Vacancy' Minisseries". Variety. 6 June 2014. Retrieved 12 August 2014. ^ "Guinness Penguins". YouTube. 8 August 2006. Retrieved 14 March 2010. ^ "No. 54993". The London Gazette (1st supplement). 30 December 1997. pp. 1–2. ^ "No. 55229". The London Gazette. 18 August 1998. p. 8994. ^ "The one with Gambon corner". Top Gear. Archived from the original on 10 October 2014. Retrieved 5 October 2014. ^ "Top Gear: Series 8, Episode 5". Top Gear. Retrieved 6 October 2014. Wikimedia Commons has media related to Michael Gambon.